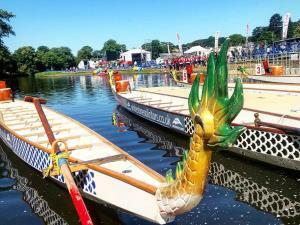 The date for next year's Bradford Dragon Boat Festival has been set. Friday will be a dedicated day for schools whilst the weekend will see teams from across the region converge once again on Roberts Park to “Race the Dragon” on the River Aire raising money for charity and helping to make a difference to so many lives. The Bradford Dragonboat Festival is proud to support the Bradford Lord Mayor's Appeal. The event promises to be a fun filled family festival with dragon boat racing on the river and landside attractions for all to enjoy including children’s entertainment, charity stalls, catering stands, landside games, bar, live acts and much, much more. So get together with your colleagues, friends and family for a fantastic day out and let’s Race the Dragon!